Thank you to everyone who emailed in and applied to join the team. I was so taken back by the response. Thank you so much. It was so fun reading through and seeing all the beautiful projects, but really hard having to turn people away. I’ve had many of those ‘thank you, but no thank you’ emails and I know exactly how it feels. I totally understand the courage it takes to email and put yourself out there, but sadly I can’t say yes to everyone. I would love to introduce you to our new team. I’m really looking forward to introducing you. These ladies are incredibility talented and I personally find them very inspirational and hope you will too. Each one comes with their own expertise in their own field which I love. 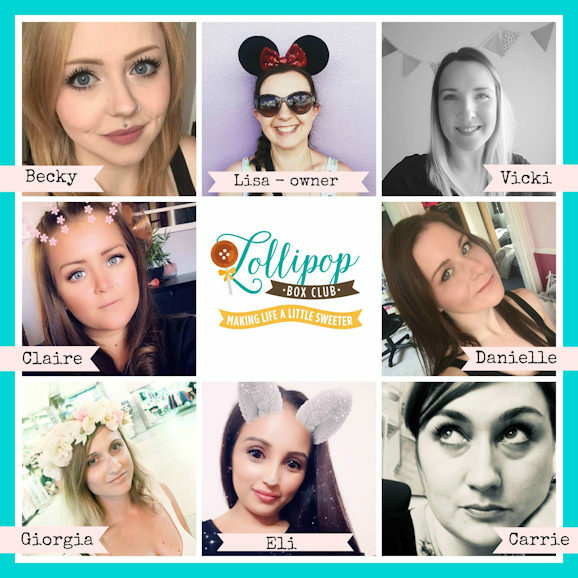 So here is the Lollipop Dream Team. You will recognise Becky and Vicki at the top with me. These two are our good all round crafters. Amazing projects, they both really see ‘outside the box’. Both scrapbook, have planners and so many ideas. Vicki is also taking over from Geraldine and is now running our Lollipop Chat Group. You will also recognise Claire and Danielle. Claire is our whizz with planners and also creates stunning Smash Books. Danielle is our mixed media artist. This girl must have pertinently inky/painty fingers. Danielle creates such fun videos. And now on to our 3 new ladies. I’ve asked them to tell us a little bit about themselves so we can get to know them a little better. We have Eli from Chicago, USA. Eli is a Mummy and creates the most stunning planners. You will also find other creative projects and TN’s on there too. And I love Eli’s YouTube Channel here. I hope you will check her out online. I can’t wait to see how she uses our kits. We also have Carrie joining us. Carrie is from the UK. Carrie says she’s been scrapbooking and dabbling in mixed media since 2012. She says she’s never happier than when she’s covered in paint and surrounded by treasures! Her style is bright and messy but is always up to trying new things. You can find Carrie on Instagram here. Carrie is also very active within our chat group here where you will see lots of her creations. And finally please meet Giorgia from Italy. Giorgia is a new mummy to sweet baby Isabella. She started scrapbooking about 9 years ago to preserve memories and couldn’t stop. She especially loves making layouts but also enjoys making mini albums, cards and home decor. She says her style is colourful and she loves to mix patterned papers and play with embellishments. So that’s our new team. I’m so excited. We’ve had lots of changes and improvements to Lollipop this past year and I know this year things will continue to grow and improve. Thank you so much for all your support and a BIG Congratulations to our wonderful new team.